Given that biology of both species is temperature sensitive both are useful barometers of climate change impacts on Atlantic shelf dwelling species. Growth signatures in the valves of the clams provide tools to reconstruct both demographics of the populations, thus providing descriptions of temporal and spatial recruitment in addition to documenting trends that may be related to climate change impacts associated with gradual warming of the southern Mid Atlantic Bight. 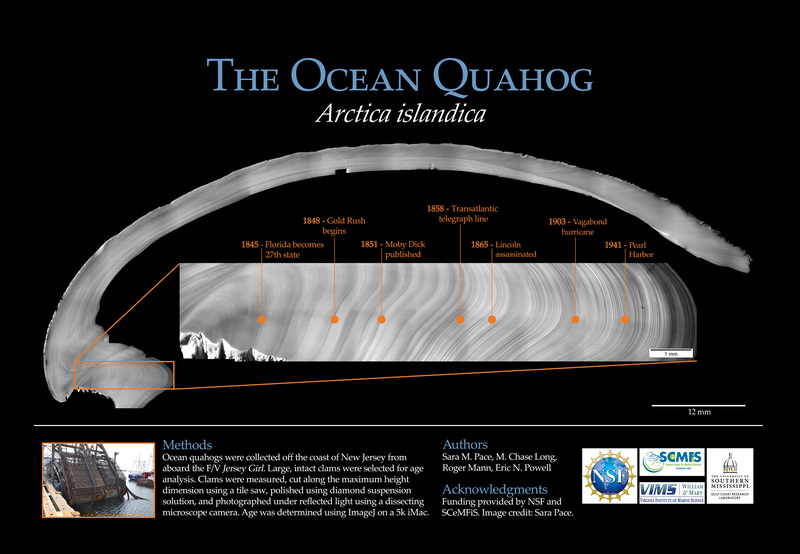 Ocean quahog (Arctica islandica) age study: Ocean quahogs were collected off the coast of New Jersey from aboard the F/V Jersey Girl. Large, intact clams were selected for age analysis. Clams were measured, cut along the maximum height dimension using a tile saw, polished using diamond suspension solution, and photographed under reflected light using a dissecting microscope camera. Age was determined using ImageJ on a 5k iMac.